Bond Beam Design | What is Bond Beam? This construction article provides detail information on bond beam. The bond beam refers to the courses of block built up with special units. They are an integral section of a masonry wall assembly. These units are employed to integrate the horizontal reinforcement with vertical reinforcement bars in a reinforced masonry wall. The bond beam performs various activities like binding the reinforced masonry structure jointly around its boundary to produce a stronger unit. 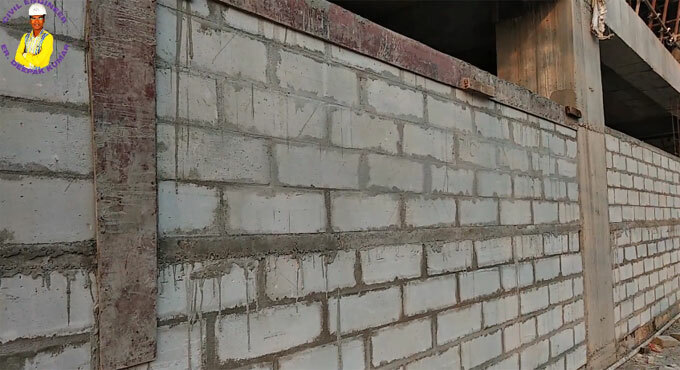 The purpose of bond beam is to bear the weight of masonry above as well as solidify the lateral resistance of the wall. The bond beam acts to transmit the horizontal strength to a wall where it is not possible to be braced with floor or roof structure. Bond beam encloses steel reinforcement in grout or concrete and tie the structure together horizontally and frequently interlock with supplementary vertical reinforcement. A bond beam is generally provided adjacent to the top of a freestanding wall. It is also utilized to offer a constant anchorage for floor or roof structure. Bond beams are normally reinforced with steel. Bond beam blocks with rectangular shape and hollow space in the middle, are attached with one another through the application of grout. The blocks themselves can comprise of a U-shaped hollow space or two square cutouts in the middle. Bond beams are arranged at the top of walls and at any intersection among wall and floor to help in distributing the weight of the wall so that the walls withstand strong winds. The bond beams are suitable for the areas prone to severe earthquake activity. Bond beams are also suitable for swimming pools to get rid of wall cracks and retain the integrity of the structure. Yurts and carports are arranged to resist the components when their roofs are situated on a concrete bond beam. Barns also benefit from well-placed bond beams. To get detail construction detail, go through the following video tutorial.